How Does One Dress to Buy Dragonfruit? 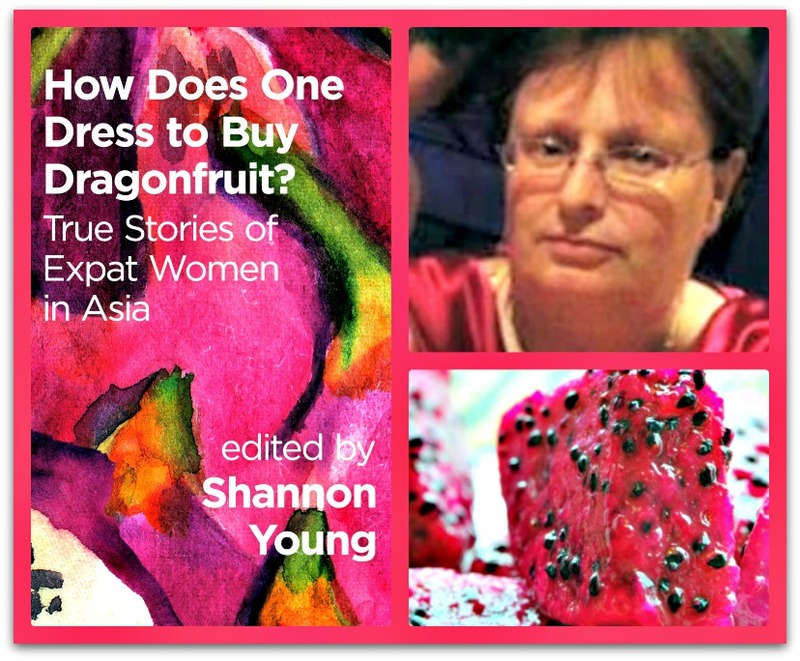 True Stories of Expat Women in Asia is a new anthology edited by columnist Shannon Young. For the benefit of Displaced Nation readers, Shannon has generously carved out a few tasty morsels from the writings of the collection’s 26 female contributors, highlighting their feelings of displacement within Asia. This is the second installment. The first can be read here. For our October excerpt, I’ve chosen Kathryn Hummel, an accomplished poet whose prose immediately stuck out to me for its lyrical quality. She uses intricate details to make her life as an Australian expat in Japan come alive, and she captures the emotions of displacement beautifully. Kathryn also uses a unique structure featuring a poem followed by a meditation on the stages of expat life: from arrival to finding community to a mid-life crisis of sorts to acceptance. Kathryn draws the full map of a life abroad. Sometimes there are moments that catch in the flow of the everyday like a taped-up tear in a reel of film. Afterwards, there is an almost imperceptible change in the tension and projection of life, when I feel more than I see that Koenji is not my place. While I am closer than a stranger, I am still at a distance: this I measure from the inside out, since I can’t get far enough away to see it as an onlooker, detached but still interested in how the scene rolls on. For the past two years, the everyday scenes of my life have had Japan as a setting: most of these have been concentrated in the district of Koenji-minami, Suginami Ward, Tokyo. During my first weeks here, I intoned that address so many times it became a mantra, a verbal talisman to guard against losing myself in the city. Although being an expatriate—a collection of syllables I don’t often apply to myself—places me in a position of being both inside and outside, when I hear the wooden heels of my shoes clip the now familiar walkways of my neighbourhood, I am reminded only of this place, my present. but the mechanics of realisation. where before I was going. Being present in a place means you inevitably paint yourself in the picture, draw the map around you. Slip outside these bounds and you are lost, or so I once thought. In 2004 I had stopped in Japan on my way from China to Australia and was delighted by my weeklong visit. I knew that living and working in Japan would be harder than traveling through, when my only responsibility had been to find the best way to be happy before my set departure date. Still, I had friends in Japan and their phone numbers to call; a Japanese language certificate and alphabet flashcards; a few tatami mats’ worth of rented space and a position, courtesy of an arts-exchange program, to write words for an intimate Koenji gallery wanting to commune with the English-speaking art world. If the present was a leafy bough, my future (as well as my literary imagery) would be heavy with the fruit of my Japanese incarnation. I arrived in Osaka and rested for a few days at the home of Quentin, a university friend who had spent the last three years of his life traveling back to Japan to teach English, a compulsion he would spend another three years satisfying. At Quentin’s suggestion, I made my way to Tokyo on a journey of acclimatisation and language practice. I took a slow train to Hamamatsu to go on a gyoza (dumpling) hunt and traveled on to Yaizu, where, walking to the beach to see the distant Fuji-san bathed in the light of sunset, I met and later made love to a fish-factory worker from Peru. Yet even this encounter had the day-seizing quality of one made on a transient journey only. When I reached Tokyo, the city was so miserably wet I thought it would never dry out. As arranged, I was met at Koenji station by my landlord, whose easy graciousness flickered warmth over my arrival, and accompanied to the building where my first studio apartment was waiting. After giving me a tour, which consisted of opening the bathroom door and indicating to the rest of the open-plan space, diminished by a folded futon and my wet bags, my landlord retreated with a bow. I was not delighted by Tokyo so far but wanted to be, so I gave my wool scarf a tighter wind, armed myself with an umbrella and ventured out. During my walk, I found that the compass on my Bleu Bleuet watch was only for show—an incidental discovery, since instinct is the direction I rely on above all. At that particular moment, I had none, and the rain didn’t help clarify my position. It leaked somehow through my umbrella and under my collar, where it remained without guiding me. As it usually happens when I walk the streets of a new place, I got lost. The houses lost me. Or I lost myself in them. Every grey, dun, or cream-colored structure fit together in a maze of reinforced concrete. Some homes were irregularly shaped to sit correctly on their blocks; others had strange additions that seemed the architectural equivalent to tusks and antlers; oddly shaped, overgrown bonsai sprouting various thicknesses of branch and colors of foliage mingled with low electrical wires; antennas, rubbish bins, sometimes just inexplicable but neatly arranged collections of junk, assembled to give the impression that it was still of use, awaited their purpose. There was an element of seediness that did not feature in my memory of Japan: paint peeled from wooden walls and bald light globes had been left burning after midday. In the alleys behind restaurants, I was met with cardboard boxes, broken brooms and wooden pallets, rusty machinery and empty cans of cooking oil. The rain blurred the scenes without actually softening them, making greyer what was already dismal. I told myself not to try to make sense of the maze. Tomorrow I would find my way to the gallery where I would be working and meet Kenzo-san, its owner, and all would be well if I believed all would be well. At the same time I thought, with naïveté or impatience, that I had to have a plan, that aimlessness would prevent me connecting to Koenji. Quentin’s advice may have worked admirably for him in his various Japanese incarnations, but has never yielded the same results for me. I was then, and remain, “Kassorin-san,” a woman who navigates her own way. On that first afternoon in Koenji, I continued to walk until I at last saw something that indicated my flat was not far off: a secondhand bookshop I never have learned the name of, though I did eventually begin to buy books there that I hope to read, one day, with ease. The bookshop is recognisable during the day by its awning of green-and-white stripes, at night, by its security doors. Each of the three doors is painted with a face: one with running mascara and a Clara Bow hairdo, one with a sweat-beaded forehead and a guilty laugh, the last with an angry eye and an imperious-looking nose. These faces, which remain guarding the bookshop until 11:00 am each day, signal more than my location—they are signposts for my mood. Depending on whether my mind is full or empty as I walk past on my way to the gallery or language lessons or the house of a friend, I either ignore or sympathize with whatever I can read in their expressions: their moods always change. It seems charmingly whimsical to write that these faces were my first friends, though when I realised this, I knew it was time to stop observing and start finding my community in Koenji. 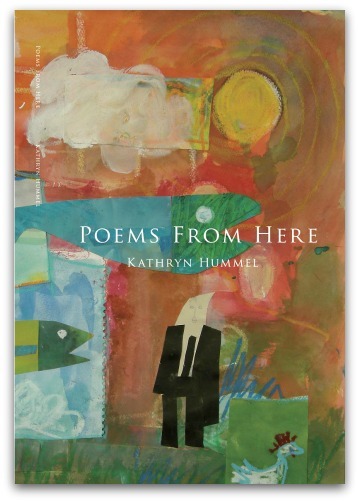 And if this excerpt has made you curious to learn more about Kathryn Hummel, her new collection of poetry called Poems from Here has recently been published by Walleah Press. You can also find out more about Kathryn at her author site: KathrynHummel.com. I look forward to sharing more excerpts from the Dragonfruit anthology over the next couple of months. Thank you so much, Shannon! Displaced Nationers, any comments on what Kathryn had to say in this passage? Having lived in Tokyo myself, I found her description of the city captivating. I was also impressed by her determination to “navigate her own way” in a city that makes many of us Westerners feel we’ve stepped through the looking glass. How Does One Dress to Buy Dragonfruit? 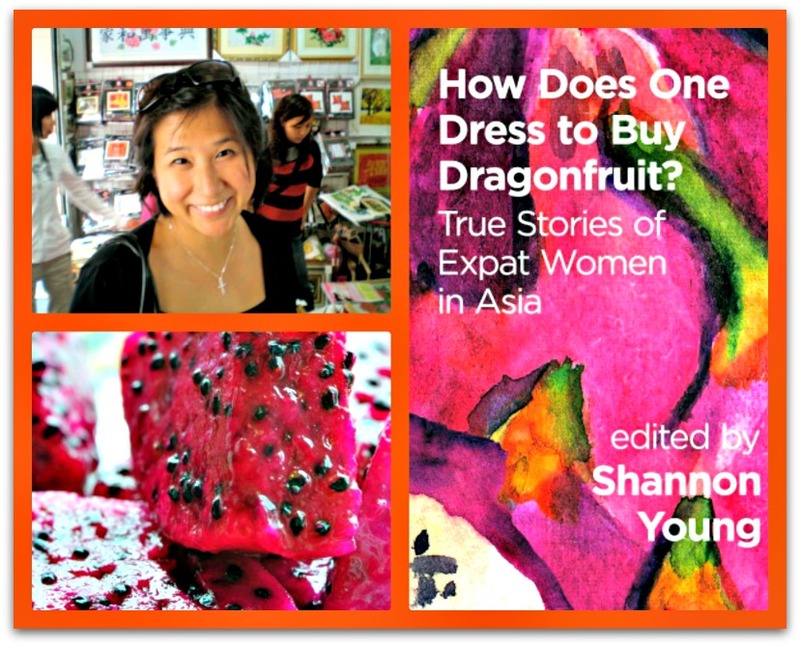 True Stories of Expat Women in Asia is a new anthology edited by our latest columnist, Shannon Young. 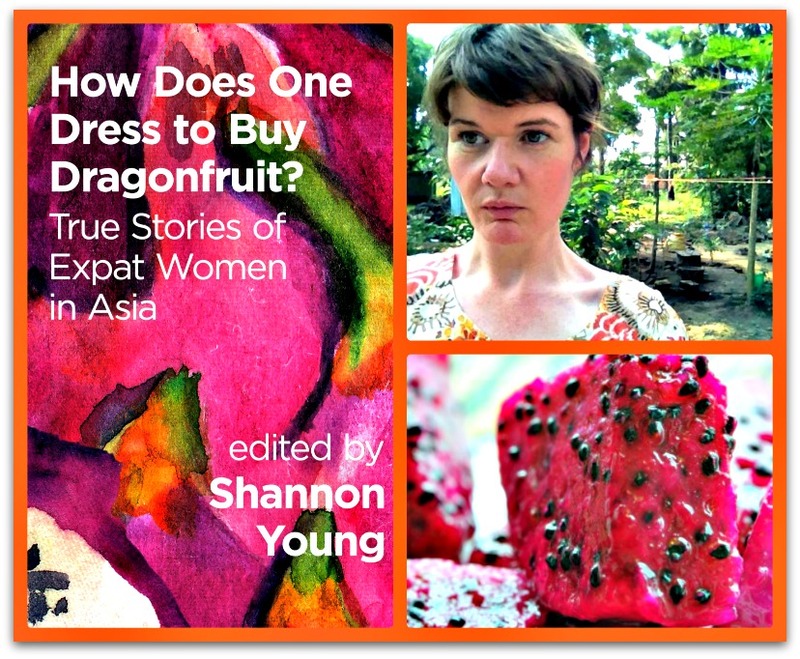 For the sake of the Displaced Nation audience, Shannon has generously agreed to carve out a few tasty morsels from the writings of the 26 female writers within the collection that highlight their feelings of displacement within Asia. Take it away, Shannon! Thanks, ML. I’m excited to be doing this. The very first excerpt comes from a piece by Dorcas Cheng-Tozun, called “The Weight of Beauty,” which covers the insecurities she experienced as a Chinese American woman living in China. Dorcas worries that her command of the language doesn’t match her Asian face and her average American weight is considered fat in China (she knows because strangers tell her!). Despite the difficulties, she finds an unexpected connection with her slim, beautiful, bilingual Mandarin teacher. “If you went running every day, you could lose some weight.” A maintenance worker with a receding hairline squinted at me as the elevator in our apartment building rose far too slowly. This was the first time I had ever interacted with this man. Unfortunately, he was speaking Cantonese, which meant that I understood him perfectly. “Mmm…” I responded, avoiding his eyes. “Really. If you ran every day, you could lose some weight,” he repeated, concerned that I had not given him a proper reply. I flashed him a tight smile, but I did not trust myself to say anything else before he stepped out of the elevator. As I watched his stooped, retreating back, I tried to remember how I was considered “petite” and “tiny” by my American friends. But the US was, literally, half a world away. When my husband and I moved to China in the summer of 2008, my body’s relative mass seemed to triple during the time it took us to cross the Pacific Ocean. From my first day living in the industrial city of Shenzhen, my weight was a favorite conversation topic of friends, colleagues, and acquaintances alike. “You’re rather fat,” I would often hear. Or, “Did you gain weight? You look fatter.” If I stepped into a shop, sales clerks would rush forward, stopping my progress with wild gesticulations communicating that they had no merchandise remotely close to my size. My figure was not the only thing wrong with me in the Middle Kingdom. I had grown up speaking Cantonese in the United States, but I knew barely any Mandarin. And judging by the reaction of the locals, my lack of language skills was by far my greater sin. Restaurant waitresses turned up their noses at me; grocery store cashiers clucked their tongues at me; taxi drivers quizzed me endlessly about my deficiency in Mandarin. My life in China at times felt like a series of one-act plays in which characters emerged with the sole purpose of telling me how stupid, fat, and just plain wrong I was. “Ignore them,” my husband Ned, whose Turkish and Jewish roots had combined to make him look generically Caucasian, urged me. That was the problem: they thought they knew me. I was a Chinese woman living in urban China, so knowing how to speak Mandarin was the minimum criterion for proving my sentience. It was equal to a blonde, blue-eyed woman in a cowboy hat and boots in rural Texas barely comprehending a word of English. It just wasn’t supposed to happen. In exasperating contrast, the locals regarded Ned like a creature with magical properties. They were entranced by his height and broad shoulders, his light hair and green eyes, and they immediately set the bar for cultural competence at zero. All he had to do was say, “Ni hao,” and the same individuals who had been glaring at me as if I had insulted their ancestors as far back as the Tang Dynasty would glow with beatific smiles and tell Ned how amazing his Mandarin was. Ni hao was Ned’s universal password to obtain what would forever be denied to me: respect, attentive service, automatic entry into heavily guarded buildings, and a mysterious fount of Chinese joy and happiness that seemed to emerge only at the white man’s touch. “He’s my husband” was a Mandarin phrase I quickly learned to say. Under the daily barrage of insults and sneers, my former life in the United States as an independent, competent, well-adjusted young woman began to recede from memory. It was as if that old version of me had never existed, as if I had always been the overweight, bumbling idiot that 1.3 billion people seemed to think I was. I learned to wear an I-don’t-care-what-you-think expression on my face, but in reality, my defenses were only shadows of battlements. I felt as if I was constantly under siege; even the most innocuous encounter could become a surprise assault. One day I greeted a deliveryman at the door of the office where Ned and I worked. I had done this several times before, and the routine was easy. All I had to do was say “Ni hao,” take the package, and sign for it. But this time, when I handed the clipboard back to the deliveryman, he scrutinized my signature before eyeing me suspiciously. “Why don’t you have a Chinese signature?” he asked in Mandarin, a stony expression on his face. “I’m American. I only have an English name.” I spoke slowly and gave him a small, apologetic smile. “Why don’t you have a Chinese signature?” he repeated stubbornly, red blotches blooming across his forehead. “I was born in the US I only have an English name,” I repeated just as stubbornly, all traces of the smile gone. I didn’t understand any of the words he spat at me after that; he was speaking too fast and I was too shocked at his venomous tone. Knowing that I had just been deeply insulted, I refused to give him a response. We faced off in silence for a few tense moments before he turned on his heel, continuing to mutter vitriol under his breath as he walked away. At that moment, learning Mandarin became my top priority. I contacted a company called New Concept Mandarin, which focused on teaching conversational survival Mandarin. They promptly responded, offering to send a company representative to my office the following day. When I told Ned about it, he asked to join in on the meeting to see if the classes were right for him as well. The next afternoon, when I heard a knock at the office door, I jumped up from my desk. “I’ll get it,” I announced to the office in general. Easing the door open, I called a cheery “Ni hao” into the dimly lit hallway. Then I froze. “Ni hao,” responded the supermodel standing in the doorway. I couldn’t stop the thought from entering my mind: If this woman isn’t from New Concept Mandarin, she must be a high-class prostitute. My eyes locked first on her dress, a body-hugging, black-and-white-striped mini that revealed every impeccable curve on her petite form. The shine of her straight, long black hair, which she casually tossed behind one shoulder, mesmerized me; her wide almond-shaped brown eyes, her thin upturned nose, and her closed-lip smile left me in awe. As I stared at her, I remembered how I had barely brushed my hair that morning; how I had a grease stain on my blouse from lunch; how I had an angry zit on my forehead that was probably doubling in size at that very moment. “Are you from New Concept Mandarin?” I asked in a squeaky voice. “Yes,” the vision said confidently, with only a trace of a Chinese accent. “My name is Joanna.” She held out a tiny hand adorned by a French manicure. I shuffled to the conference table in the middle of the office, conscious that five pairs of eyes followed our progress. The room suddenly felt too open, too public. I didn’t want all my colleagues—and certainly not my husband—seeing what I saw: this epitome of Chinese beauty in juxtaposition with the ungainly, unkempt Chinese American who actually liked to eat. I invited Joanna to sit in a black swivel chair. She descended gracefully into the seat and crossed her slender legs. I attempted to imitate her movements, but instead I had to steady myself on the armrests when I nearly missed my seat. Clearing my throat to hide my embarrassment, I asked Ned to join us. And if you’re curious to find out more about Dorcas Cheng-Tozun and her writing, she can be found at chengtozun.com. I look forward to sharing more excerpts from the Dragonfruit anthology over the next few months. Thank you so much, Shannon! Displaced Nationers, any comments on what Dorcas had to say in this passage? Have you ever had the experience of having people look at you but not believe you were (or weren’t) speaking their language? I speak of the phenomenon known as cognitive dissonance…which can make one feel very displaced. Tell us about it, or any other responses you’ve had to this excerpt, in the comments! STAY TUNED for tomorrow’s announcement of the September Alice Awards.